A380 of ANA All Nippon Airways Rolls Out of Assembly Shop. 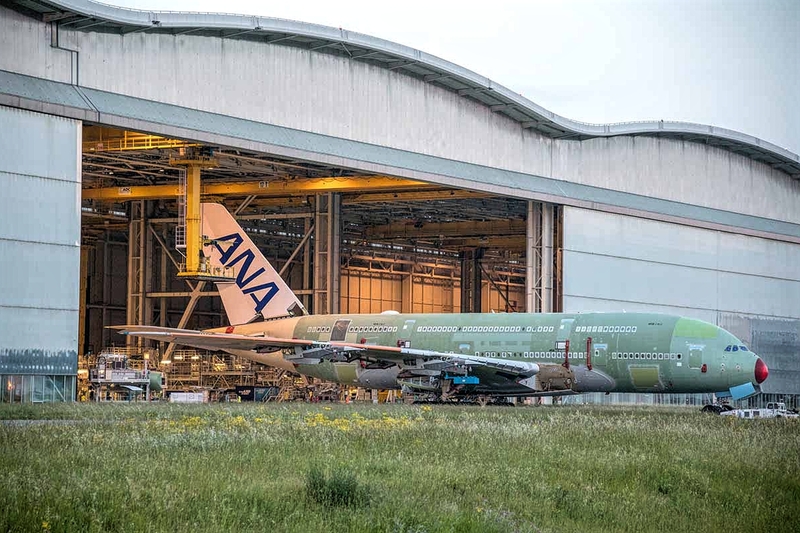 After the start of the final assembly in April, the first A380 of ANA (All Nippon Airways) has completed the assembly of the cell and today debuted in Toulouse. With the ANA logo on its vertical tail, the aircraft has been moved to an outdoor station where structural completion, engine installation and cabin equipment will be carried out. Testing of the electric power system, hydraulic power and air conditioning will also be carried out. The A380 of ANA will be equipped with an extraordinary premium configuration of eight seats of First Class, 56 seats of Business Class, 73 seats of Economy Class Premium and 383 seats of Economy Class, which include 60 seats of sofa. ANA placed a firm order for three A380s in 2016, becoming the first superjumbo customer in Japan. The first delivery is scheduled for early 2019, and the A380 will initially be operated on the Tokyo-Honolulu route. The A380 of ANA will present "FLYING HONU", a special livery of Hawaiian sea turtles that symbolizes good luck and prosperity. Earlier this year, the airline announced that its three A380s will be configured with 520 seats, eight in the first place, 56 in business, 73 in premium economy and 383 in economy. The aircraft will be powered by Rolls-Royce Trent 970 engines. The delivery of the first A380 to the Japanese carrier is scheduled for early 2019, after which it will be deployed on the Tokyo-Honolulu route. The A380 is the largest and largest aircraft in the world that offers passengers the smoothest, quietest and most comfortable ride. With two full wide-angle decks, offering wider seats, wide aisles and more space, the A380 has the unique ability to generate revenue, stimulate traffic and attract passengers. The A380 will help meet growth and overcome capacity restrictions at Tokyo airports.